I am officially obsessed with Red Heart’s Hygge yarn!! 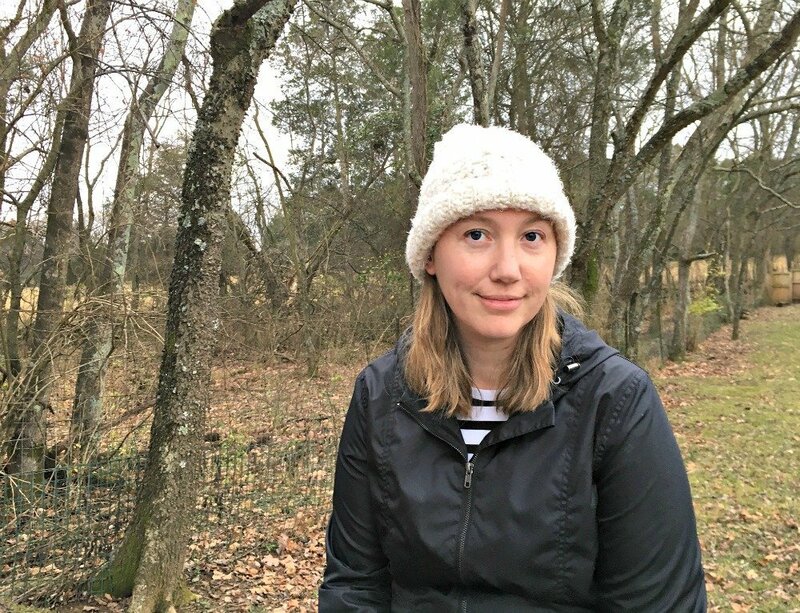 First I made the Hygge Shawl, then on to my new favorite mitten pattern, the Hygge Mittens, and now I’ve made a hat with Hygge!! I really love this mini bean stitch and it worked so well with this yarn. This is seriously one of the softest, squishiest yarns I’ve ever felt and I really love it. If you haven’t tried it yet – what are you waiting for?! Modified Bean Stitch (mbs): insert hook into st and pull up a loop, yo, insert hook into same st and pull up a loop (4 loops on hook), yo, pull through all loops on hook. Modified Bean Stitch 2 Together (mbs2tog): insert hook into first mbs, pull up loop, yo, insert hook into next mbs, pull up loop (4 loops on hook), yo, draw through all loops on hook. Ch 2 at beginning of ribbing row counts as hdc. Be sure to work into this turning chain at the end of the next row. Row 1: Hdc in 3rd ch from hook and each ch; turn – 6 sts. Row 2: Ch 2, skip first hdc, hdc back loop only in each st; turn – 6 sts. Rows 3-50: Repeat row 2. Join with slip st to first row, making a circle. Be careful not to twist ribbing. Change to larger hook. Ch 1, sc 54 sts evenly around edge of ribbing. Round 1: Ch 2, mbs in first st, *ch 1, sk next sc, mbs in next sc; repeat from * to last st, ch 1, skip last sc, join to first mbs with slip st; turn – 27 mbs. Round 2: Ch 2, mbs in first mbs, *ch 1, mbs in next mbs; repeat from * to end, ch 1; join to first mbs with slip st; turn. Rounds 3-16: Repeat round 2. **If you would like the brim not to be turned up only work 12 rounds total from ribbing, then work the following rounds. Round 17: Ch 2, mbs in first mbs, (ch 1, mbs in next mbs) 6 times, *ch 1, mbs2tog, (ch 1, mbs in next mbs) 7 times, repeat from * two times, mbs2tog, ch 1, join to first mbs with slip st; turn – 24 mbs. Round 18: Ch 2, mbs in first mbs, ch 1, mbs in next mbs, *ch 1, mbs2tog, (ch 1, mbs in next mbs) 2 times; repeat from * four times, ch1, mbs2tog, ch 1, join to first mbs with slip st; turn – 18 mbs. Round 19: Ch 2, mbs in first mbs, ch 1, mbs2tog, *ch 1, mbs in next mbs, ch 1, mbs2tog; repeat from * to end, ch 1, join to first mbs with slip st; turn – 12 mbs. Round 20: Ch 2, *mbs2tog, ch 1; repeat from *, join to first mbs with slip st – 6 sts. Fasten off, leaving a long tail. Draw tail through remaining sts and pull tightly to close. Use beginning tail to sew up seam in ribbing. Weave in ends. Create a pom pom and sew to top, if desired. That’s it! I hope you have enjoyed this free pattern. 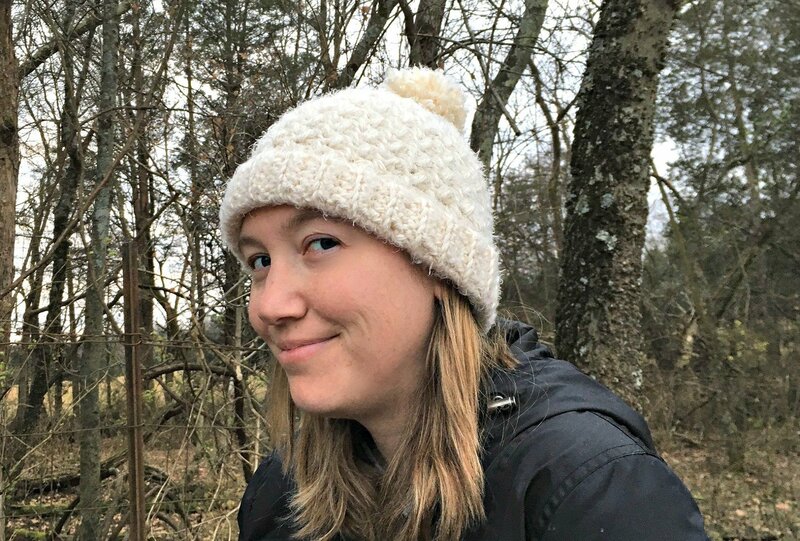 See my other free crochet hat patterns here! 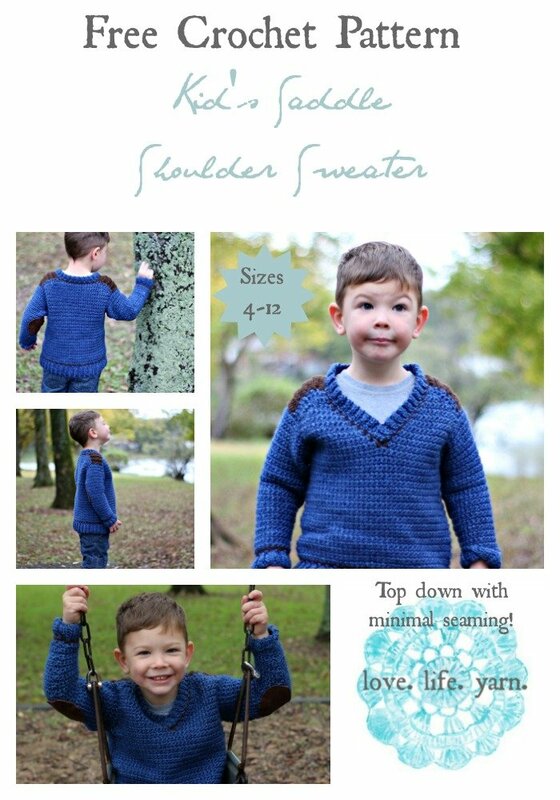 I have to admit, I am in love with this method of making sweaters. For years I have been making the front, back and sleeves separate and seaming them together at the end. With this top-down method, you work the back to the armholes, then connect the front and work to the armholes and then work in the round to the bottom of the body. Then the sleeves are crocheted on and the collar is worked last. The only seaming is at the ribbing. It’s amazing and it works up so fast!! 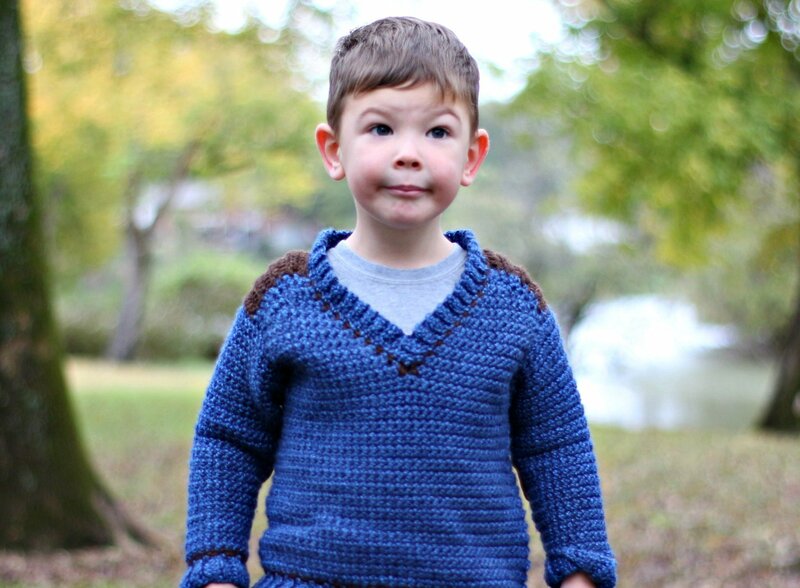 I created a V-neck version of this sweater for my third son and he absolutely loves it. 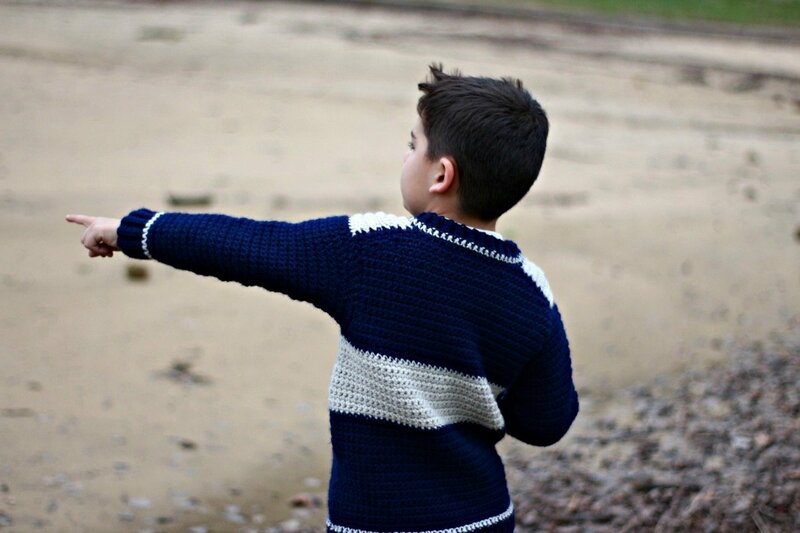 I hadn’t ever made a sweater for my second son so I knew I had to crochet one for him – pronto. 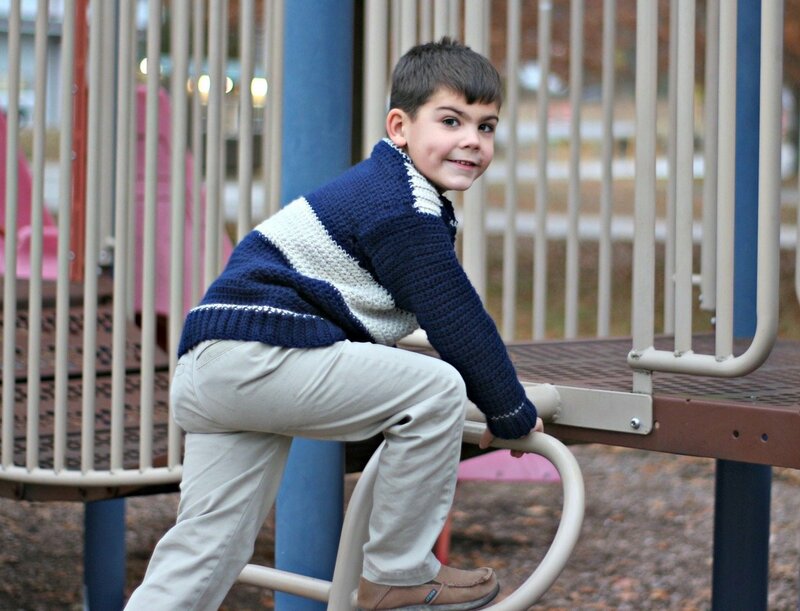 This sweater, made with Lion Brand Wool-Ease is just what he was hoping for and he loves it so much. He was also so proud to get to model for me. 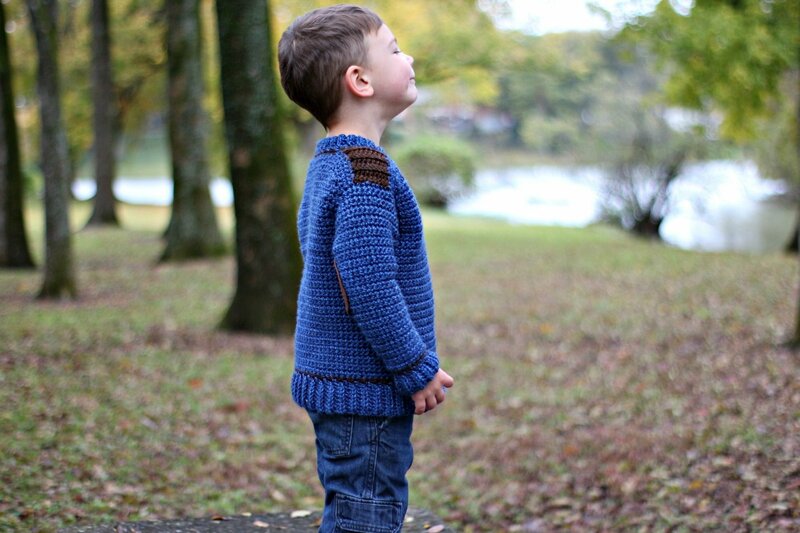 I am just thrilled with how this turned out and my testers loved it as much as I do! 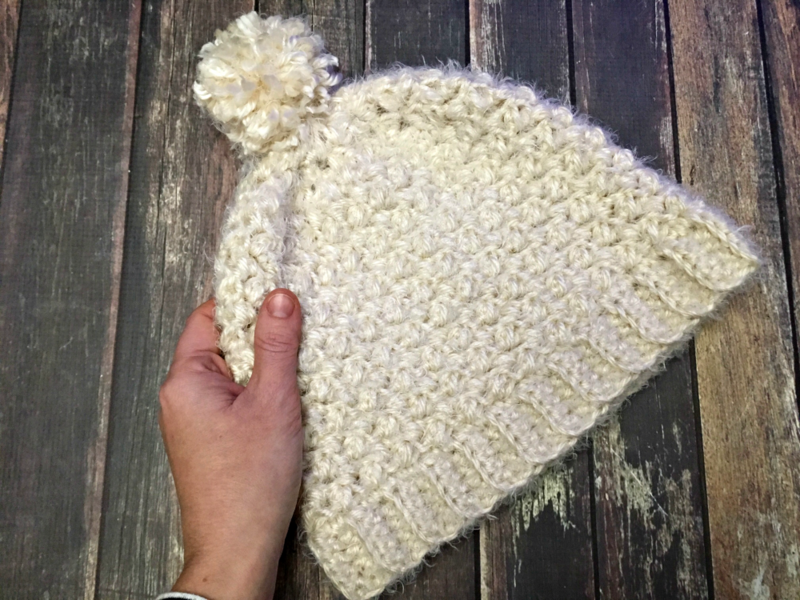 I hope you enjoy this free crochet pattern as much as I enjoyed creating it! Size: Finished Chest Size 26 (28, 30, 32, 34)” to fit kid’s size 4 (6, 8, 10, 12). 2” positive ease recommended. Shown in size 10. 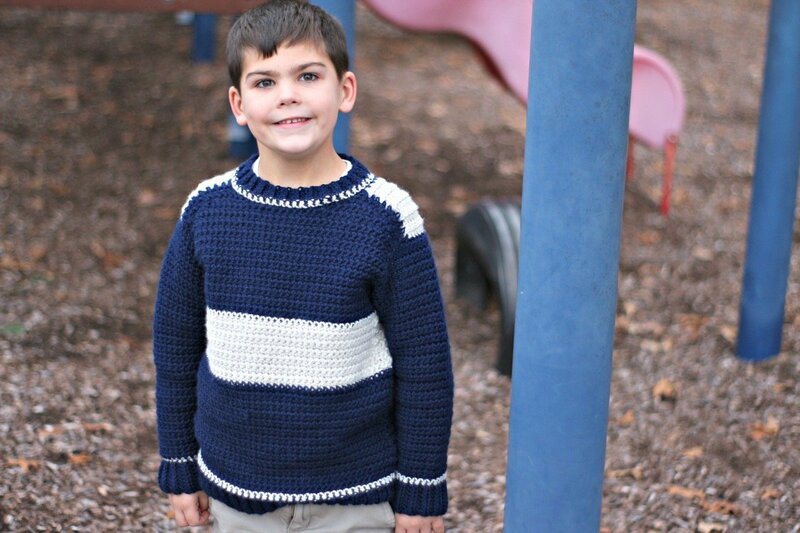 Sweater is crocheted from the top down, starting with the CC saddles. The back is worked across the saddles to the armholes, then the front is worked to the armholes and the pieces are joined. Sleeves are crocheted around armhole edges, leaving only the ribbing to be seamed. With smaller hook and CC, ch 7 (9, 9, 11, 11). Rep Row 2 until Saddle measures 2 ½ (2 ¾, 2 ¾, 3, 3 ½)” from beginning, ending with WS row. Do not turn at end of last row. Fasten off at end of first saddle. At end of second saddle, change to larger hook and MC. Row 1: With RS facing, larger hook and MC, sc 8 (8, 9, 9, 10) sts across left saddle edge opposite back, beginning at neck edge, turn – 8 (8, 9, 9, 10) sts. Row 1: With RS facing, larger hook and MC, sc 8 (8, 9, 9, 10) sts across right saddle edge opposite back, beginning at armhole edge, turn – 8 (8, 9, 9, 10) sts. Work next 12 rounds in CC, then change to MC. Repeat round 2 until lower body measures 6 ¼ (7 ¼, 8 ¾, 9 ¾, 11 ¼)” from joining round. Work one row sc in CC. Change to smaller hook and MC. With RS facing, larger hook and MC, join yarn at center underarm stitch. Work even if needed until sleeve measures 9 ½ (10 ¼, 11 ½, 12 ½, 13)” from first round of sleeve. Work 1 row sc in CC. Change to MC and smaller hook. With RS facing and larger hook, join MC with sl st at right back, directly behind saddle. Round 1: Ch 1, sc evenly around neck edge, join with slip st. Round 2: Change to CC, sc in each sc, join with slip st.
Change to smaller hook and MC. Row 1: Ch 5, hdc in 3rd ch from hook and next ch, hdc2tog last ch and first sc of body, slip st in next sc of body, turn. Row 3: Ch 2, hdc blo first 3 sts, hdc2tog blo ch-2 and next sc of body, slip st in next sc of body, turn. Repeat rows 2-3 around neck edge until you are back at beginning. Again, if it flares out then there are too many rows. 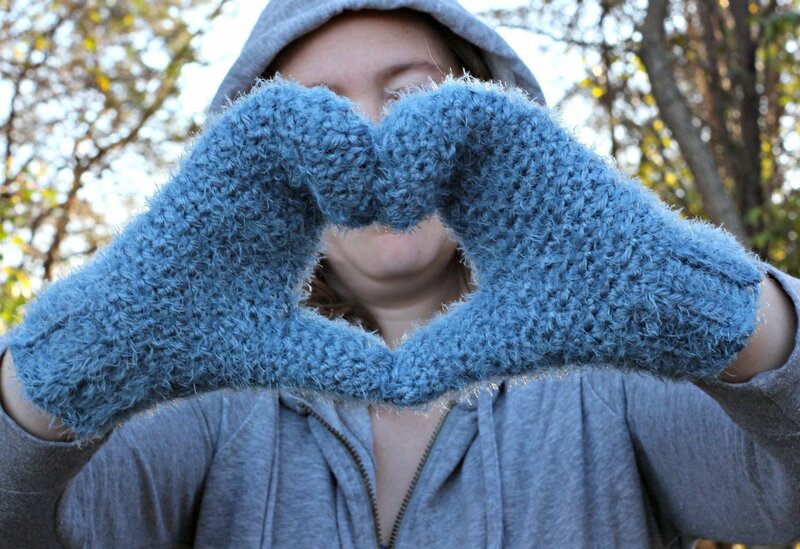 These are the softest, squishiest mittens I’ve ever felt and I am so, so in love with the Hygge yarn from Red Heart. My first project with this yarn was the Hygge Shawl and I plan on making many more warm winter accessories with this yarn. This project is one of the teacher gifts I’m making this year for my sons’ teachers. 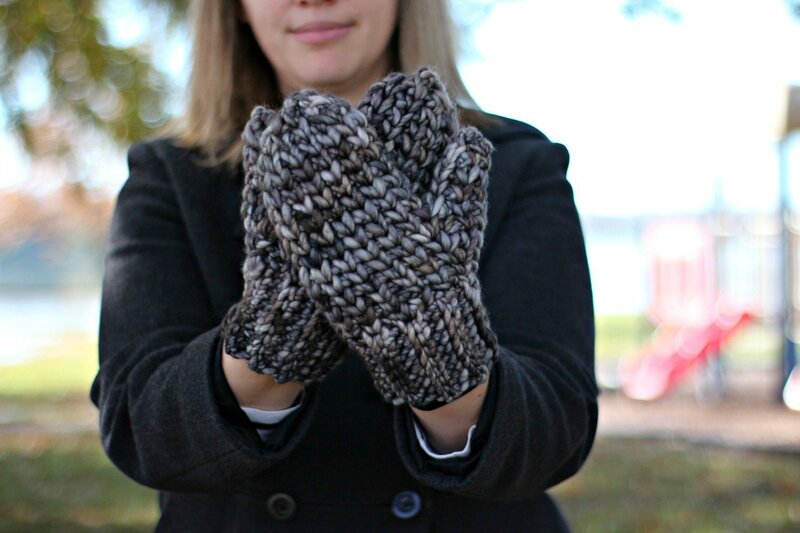 That’s four pairs of mittens I’ve designed this season! I’ve already finished the Rasta Mittens for one teacher, these mittens, and two more are almost done. I seem to get into a kick of making the same type of item over and over until a new project type catches my attention. I did that with baby booties earlier this year big time! Now my youngest is one and I haven’t made booties in a while, but mittens and sweaters are my thing of the moment. 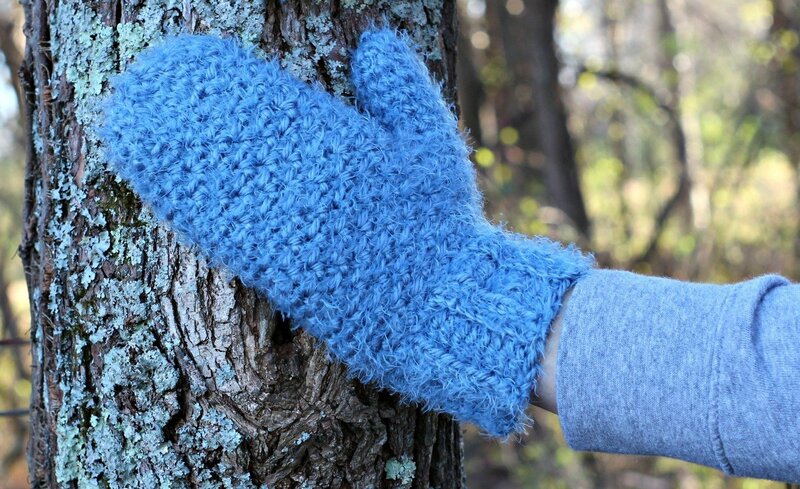 My oldest son called dibs on these mittens for his teacher – he also loves the texture and softness of the Hygge yarn. I purchase mine from our local JoAnn and they carry the larger 8 oz skeins, which can be seen in the video. I only used 3.5 oz of yarn to crochet these, though, so if you find the 5 oz skeins not to worry – you can make this set with a skein that size, too! I also used a new ribbing technique that I am really liking. I created a video tutorial just for this technique and if you watch the full video tutorial for this project you will see that it’s an easy pattern repeat that gives a unique ribbed look. I’m thinking I’m going to be using this ribbing again. 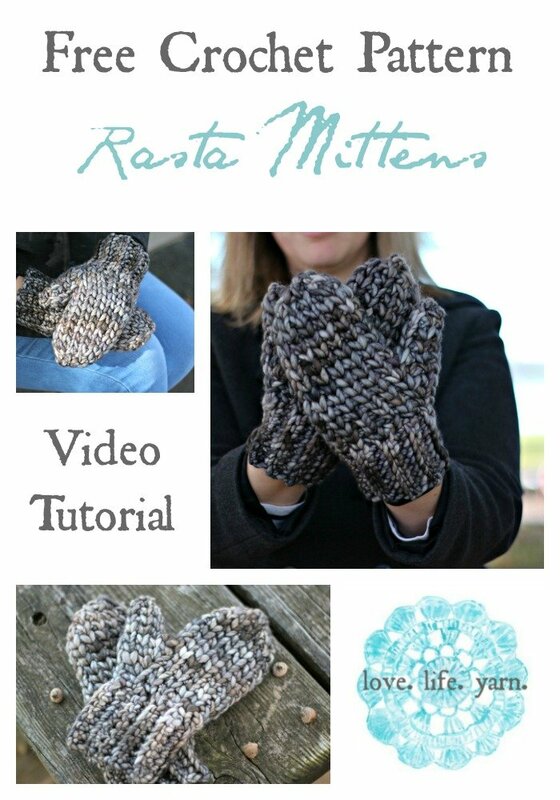 I hope you are enjoying all of these mitten patterns – be sure to check out my first pair of Basic Mittens for women and the Basic Men’s Mittens patterns, too and create a ton of warm winter accessories! Note: Mitten is worked in the round. Do not join with a slip st at end of round. blo – back loop only. Work stitch in the back loop, leaving front loop unworked. flo – front loop only. Work stitch in the front loop, leaving back loop unworked. With smaller hook, ch 13. Leave a long tail to seam up ribbing. Row 1: Dc in 4th ch from hook and each ch across; turn – 10 dc. Row 2: Working through both loops across row, sc in first st, insert hook in same st and draw up a loop, insert hook in next st and draw up a loop, draw last loop directly through 2 loops on hook, *insert hook in same st as last completed st, yo and draw up a loop, insert hook in next st and draw up a loop, draw last loop directly through 2 loops on hook; repeat from * in each st across, work additional slip st in last st; turn. Row 3: Ch 3, dc blo in each st across; turn. Rows 4-13: Repeat rows 2-3. Row 14: Repeat row 2. Seam ribbing if desired. It can also be seamed at the end after the mitten is complete. Round 1: Ch 1, sc 21 sts evenly along ribbing, place marker to note beg of round – 21 sts. Round 2: 2 sc in first st, sc 10, 2 sc in next st, sc to end – 23 sts. Round 3: *Sc flo, sc blo; repeat from * to last st, sc flo. Round 4: *Sc blo, sc flo; repeat from * to last st, sc blo. Round 5: 2 sc in next st, sc, 2 sc in next st, *sc blo, sc flo; repeat from * to end – 25 sts. Round 6: 2 sc in next st, sc 3, 2 sc in next st, *sc flo, sc blo; repeat from * to end – 27 sts. Round 7: 2 sc in next st, sc 5, 2 sc in next st, *sc blo, sc flo; repeat from * to end – 29 sts. Round 8: 2 sc in next st, sc 7, 2 sc in next st, *sc flo, sc blo; repeat from * to end – 31 sts. Round 1: Ch 1, skip next 9 sts, *sc blo, sc flo; repeat from * to end – 23 sts including ch-1. Round 2: *Sc blo, sc flo; repeat from * to last st, sc blo. Rounds 4-11: Repeat rounds 2-3. Round 12: Repeat round 2. Round 1: Sc 2, sc2tog, sc 10, sc2tog, sc 7 – 21 sts. Round 2: *Sc, sc2tog; repeat from * to end – 14 sts. Round 3: *Sc2tog; repeat from * to end – 7 sts. Fasten off, leaving a long tail. Use tail to close top 7 sts tightly and sew any gaps that might remain. Join yarn with larger hook at ch-1 space of hand. Round 1: Ch 1, sc in ch-1 space, sc 9 skipped sts – 10 sts. Rounds 2-8: Work even in sc. Round 9: *Sc2tog; repeat from * – 5 sts. Fasten off, leaving a long tail. Use tail to close top 5 sts tightly and sew any gaps that might remain. Weave in ends. Sew ribbing if not done at beginning. I have been on another stuck-on-one-kind-of-project kick lately and this time it’s sweaters!! When I first started designing in 2011 all I wanted to design were sweaters. 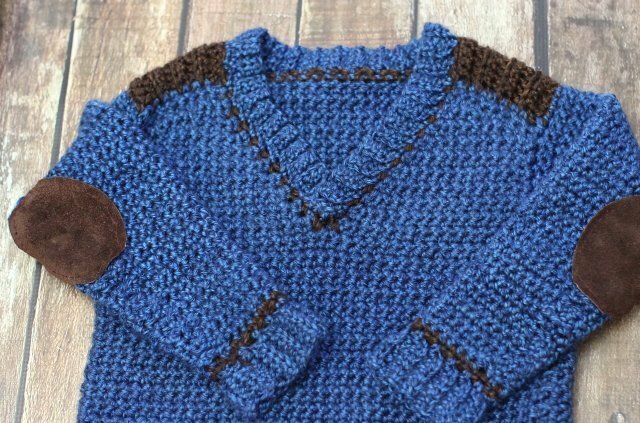 There is just something so special to me about them and I really do think I take the most pride in the sweaters I’ve designed over the years (not that I don’t like my other projects!!). So when I learned about a knitting technique of working from the top down with little seaming, I decided to try and adapt it to crochet. Guess what? It works so well!! 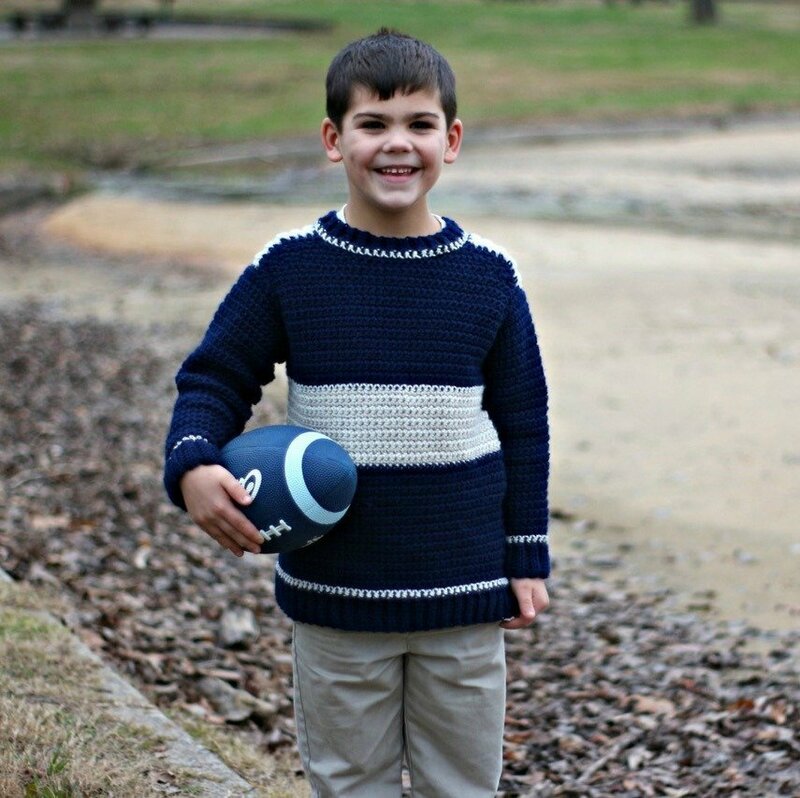 This sweater is worked from the top down so you can try it on your little one as you go and it requires very little seaming. In fact, the ONLY seaming is to close the ribbing!! I’m so in love with this new method (for me, at least!) and can’t wait to try more designs using this method. They won’t all have the saddle shoulder, but the next few will. I’m actually pretty in love with it. 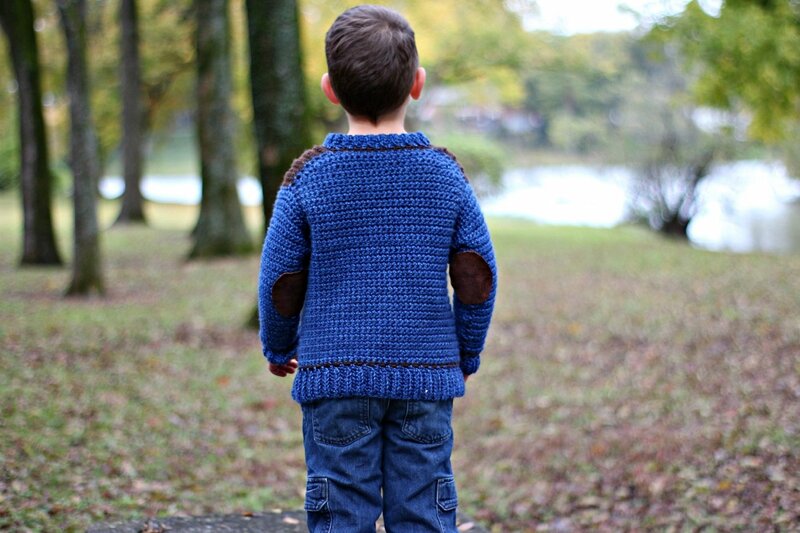 I chose Lion Brand Heartland for this sweater for the gentle color changes in each strand. I love the way they look and the feel of this yarn is great but not fussy about care. For a three-year-old’s sweater I figured this yarn was perfect. It turned out even better than I had pictured and I love the brown accents with the blue. 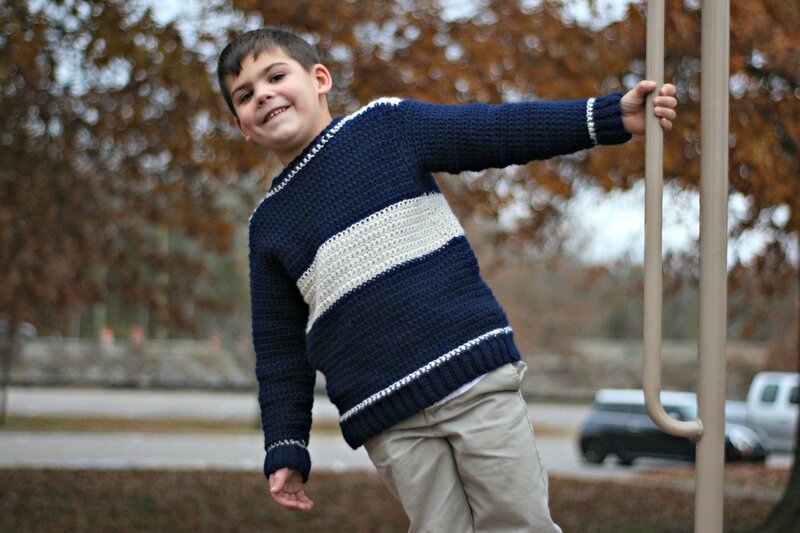 My little guy absolutely loves his sweater and my testers have reported that their little ones feel the same about theirs. In fact, they don’t want to take it off and that really makes my day. 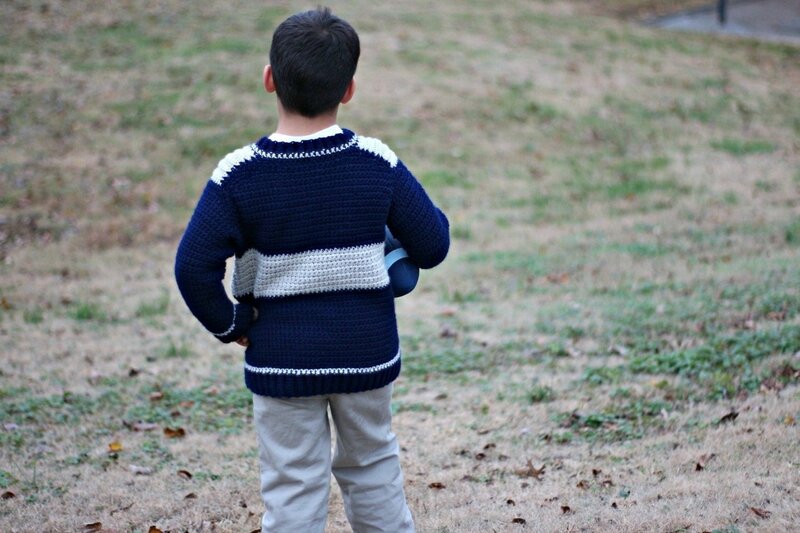 I’m making all of my boys a variation of this sweater – the crew neck version is in testing and I am even more in love with it (if that’s even possible!!). 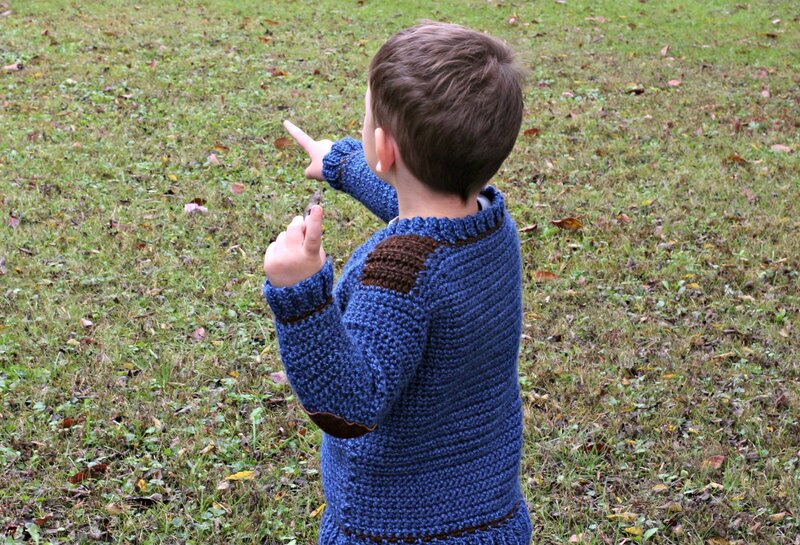 If you like this sweater be sure to check out my other free crochet sweater patterns for kids: Shawl-Collared Sweater and Comfy Cabled Hoodie. I hope you enjoy this pattern as much as I’ve enjoyed creating it. 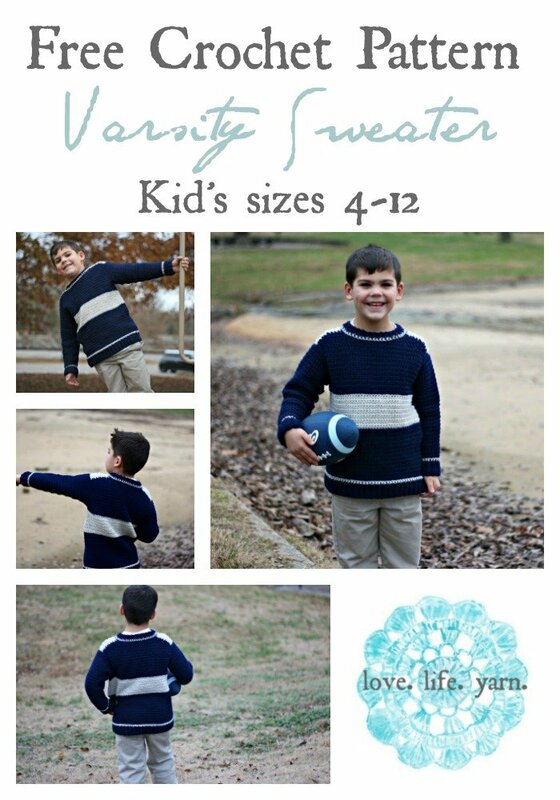 Size: Finished Chest Size 26 (28, 30, 32, 34)” to fit kid’s size 4 (6, 8, 10, 12). 2” positive ease recommended. For the left-handed tutorial, click here! Rows 2-3: Ch 1, sc evenly across, turn. Row 4: Ch 1, sc 3 (3, 4, 4, 4), turn, leaving remaining sts unworked. Row 5: Ch 1, sc 3 (3, 4, 4, 4), turn. Row 6 (Inc Row): Ch 1, 2 sc in first st, sc 5 (5, 6, 6, 7), turn, leaving remaining sts unworked. Row 7: Ch 1, sc 7 (7, 8, 8, 9), turn. Row 8: Ch 1, 2 sc in first st, sc to end, turn – 10 (10, 11, 11, 12) sts. Row 9: Ch 1, work even in sc, turn. Row 10: Ch 1, 2 sc in first st, sc to end, turn – 11 (11, 12, 12, 13) sts. Repeat rows 9-10 4 (6, 6, 6, 6) times more – 15 (17, 18, 18, 19) total sts. Row 3: Ch 1, sc 3 (3, 4, 4, 4), turn, leaving remaining sts unworked. Row 4: Ch 1, sc 3 (3, 4, 4, 4), turn. Row 5: Ch 1, sc 6 (6, 7, 7, 8), turn, leaving remaining sts unworked. Row 6 (Inc Row): Ch 1, sc 5 (5, 6, 6, 7), 2 sc in next sc, turn – 7 (7, 8, 8, 9) sts. Row 7: Ch 1, sc to end, turn – 9 (9, 10, 10, 11) sts. Row 8: Ch 1, sc to last st, 2 sc in last st, turn – 10 (10, 11, 11, 12) sts. Row 10: Ch 1, sc to last st, 2 sc in last st turn – 11 (11, 12, 12, 13) sts. Repeat rows 9-10 4 (6, 6, 6, 6) times more – 15 (17, 18, 18, 19) sts. If your size ends at center front, fasten off and join at right front armhole edge. Ch 1, sc across 30 (34, 36, 36, 38) sts of fronts. Row 1: Hdc in 3rd ch from hook and next 5 (5, 5, 7, 7), hdc2tog next ch and next sc of body, turn. Row 2: Ch 2, hdc blo in each st, turn. Row 3: Ch 2, hdc blo to last st, hdc2tog blo of next hdc and body, skipping one sc of body. Repeat rows 2-3, working row 3 into every other sc of body. If ribbing seems to flare out, you have made your rows too close together. With RS facing and larger hook, join CC with sl st at bottom right of V. Ch 1, sc evenly along right front, working a sc in every other row of front, sc across saddle and back neck sts, second saddle, and along left front, working a sc in every other row of left front, join with slip st, turn. Row 1: Ch 2, skip first sc, hdc in next 3 sts of left V, turn – 4 sts. Row 2: Ch 2, hdc blo first 3 sts, hdc2tog blo ch-2 and next sc of right front, turn. Row 3: Ch 2, hdc blo in each st, turn. Row 4: Ch 2, hdc blo in first 3 sts, hdc2tog blo ch-2 and second sc, turn. Repeat rows 3-4 around neck edge until you are back at beginning, making sure to work row 4 into every other sc. Again, if it flares out then there are too many rows. Sew end behind right front. Fasten off. Sew on elbow patches, if desired. Sew ribbing seams at sleeves and hem. For the teacher Christmas gifts this year I’ve decided to make all of the boys’ teachers a pair of mittens! Last year I designed my first pair of mittens for my oldest son’s teacher and they were a hit. I usually do hats but none of the teachers seem like they would wear them much – so mittens it is!! I’m hard at work on the other pairs but this pair is done and ready to share!! I had one skein of this beautiful Malabrigo Rasta yarn and I had been trying to decide what to make from it. 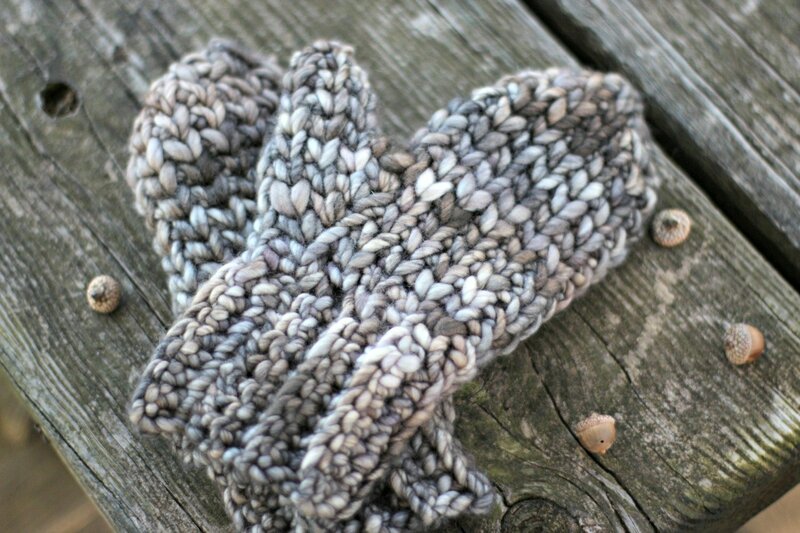 A hat would be really nice as well as a cowl as this yarn is super bulky and works up so fast, but nothing just seemed right until I decided to make these mittens with it. I love the subtle color changes in all of the Malabrigo yarns and this one is no different. If you are looking for a quick and easy gift for the holidays – here it is! 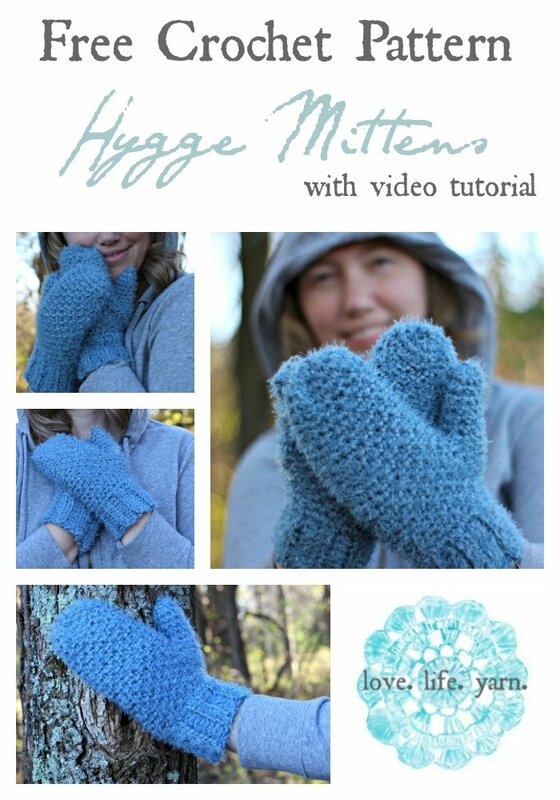 I made the first mitten and then filmed a complete video tutorial for the second. 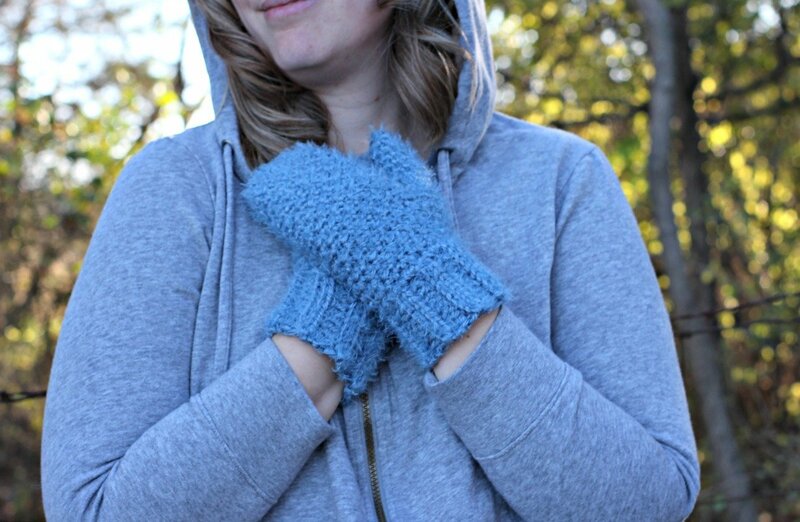 The mittens are interchangeable (meaning they can be worn on either hand) so just make two the same and you’re ready to gift! 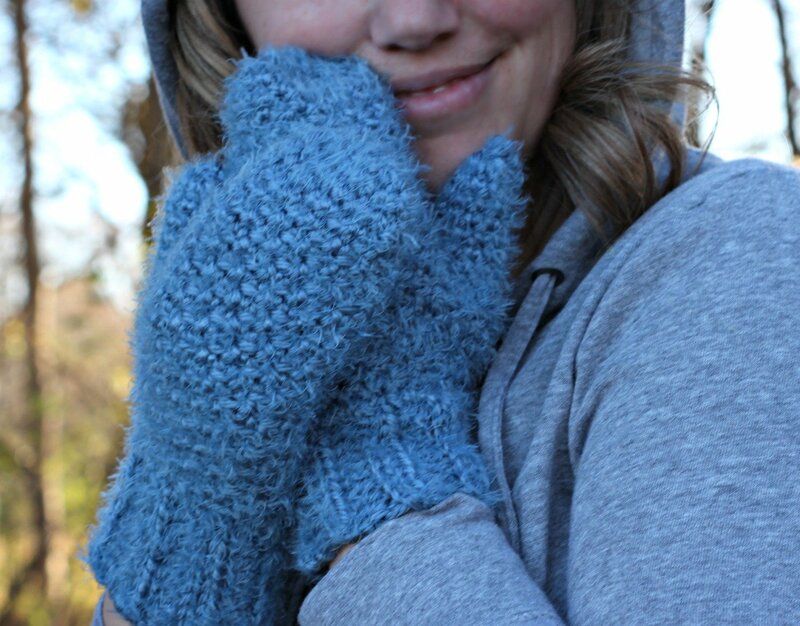 I am really enjoying designing all these mittens and I hope you enjoy! Note: Mitten is worked in the round using the waistcoat stitch. Do not join with a slip st at end of round. With smaller hook, ch 9. Leave a long tail to seam up ribbing. Row 1: Sc in 2nd ch from hook and each ch across; turn – 8 sc. Row 2: Ch 1, sc blo in each st across; turn. Rows 3-18: Repeat row 2. Round 1: Ch 1, sc 13 sts evenly along ribbing – 13 sts. Begin working all rounds using the waistcoat st. Round 2: Sc in each sc around. Round 3: 2 sc in the first st, sc, 2 sc in next st, sc to end – 15 sts. Round 4: 2 sc in first st, sc 3, 2 sc in next st, sc to end – 17 sts. Round 5: 2 sc in first st, sc 5, 2 sc in next st, sc to end – 19 sts. Round 1: Ch 1, skip next 7 sts, sc in next st and each st around – 13 sts including ch-1. Work even in waistcoat st for 6 rounds. Round 1: Sc 6, sc2tog, sc 5 – 12 sts. Round 2: *Sc, sc2tog; repeat from * – 8 sts. Round 3: *Sc2tog; repeat from * – 4 sts. Fasten off, leaving a long tail. Use tail to close top 4 sts tightly and sew any gaps that might remain. Round 1: Sc2tog ch-1 space and first sc, sc 4, sc2tog last 2 sts – 6 sts. Rounds 2-4: Work even in sc. Round 5: *Sc2tog; repeat from * – 3 sts. Fasten off, leaving a long tail. Use tail to close top 3 sts tightly and sew any gaps that might remain.